Hollywood, California – February 28, 2011 - Nick Cave & The Bad Seeds announce the latest in a series of reissues of their classic albums. 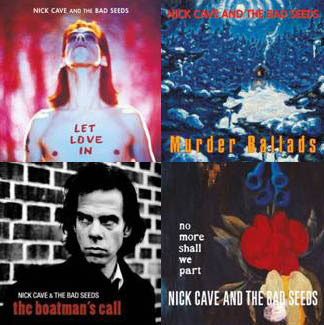 Let Love In (1994), Murder Ballads (1996), The Boatman’s Call (1997) and No More Shall We Part (2001) -- their eighth, ninth, tenth and eleventh studio albums, respectively -- will be released on May 17, each as a separate deluxe double-disc Collectors Edition. Each deluxe double-disc Collectors Edition contains the re-mastered stereo album, the new surround mix, a specially commissioned short film made by UK artists Iain Forsyth and Jane Pollard, plus b-sides from the singles, videos and exclusive sleeve notes. The first three consecutive albums in the re-mastered deluxe edition series -- From Her to Eternity, The Firstborn Is Dead, Kicking Against the Pricks -- were released in 2009. The next four in the series -- Your Funeral…My Trial, Tender Prey, The Good Son and Henry's Dream – were released last year. All were received with unanimous critical welcome.